We offer two standard types of TRUE static clings, single and double sided. Both products are produced as TRUE STATIC CLINGS WITH NO ADHESIVE! Static clings will stick to almost any smooth glossy surface such as glass and mirrors. EITHER SIDE, printed side or back, of our VersaCling Static Clings will cling to clean glass or most other clean glossy surfaces without adhesive. Mount just about anywhere—doors, windows, mirrors, display cases, and glass railings. White VersaCling material leaves no residue when removed. For extremely cold climates, we recommend our Removable Decals. Clear static cling material is also available at no additional charge. Clear cling material gives a "stained glass" effect and is great for "no smoking" signs or other messages you many want to draw less attention to. Clear cling printed images are somewhat translucent and white does not print. 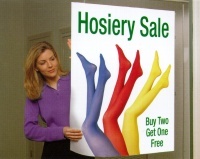 Our double sided static clings will cling to clean glass or most other clean glossy surfaces without adhesive. If you would like different images on each side, please indicate the design code for the second side and which side is to cling to the glass in your comments during customization. An additional $25 setup fee will apply for the additional layout. Double-Sided Clings have a tinted inner layer to help prevent image "show through" in bright light conditions. SETUP FEE: A $25.00 setup fee applies to orders of 55 items or less of a given design and layout. Setup fees are automatically added to your shopping cart.